Wow, WOW! Talk about an amazing new intro! We knew that Travis Strikes Again: No More Heroes was getting a new intro, but who knew it would bring the game directly into the world of Killer7?! Travis Strikes Again has been full of all sorts of surprises, but this one is on a completely different level! Thanks to Tetrodox for the heads up! We've heard Suda51 share all kinds of thoughts in recent interviews promoting the game, but his interview with Feed4Gamers has some really interesting tidbits. It also has some very Suda51-style moments, if you know what I mean. For example, Suda51 explains why he decided to create a spin-off series for No More Heroes by saying that he talked to Travis himself about it! I also spoke with Travis, and Travis says, “Wow, wow, hold off on the number of installments, ok, I need to warm up a bit before we go into something big like this, and so I know that you love Death Drive, so how about going in that direction of games this time?” and so that how it came about. 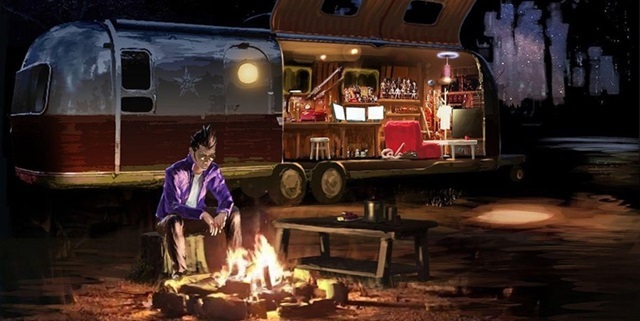 If Suda51 has his way, Travis Strikes Again: No More Heroes will be successful enough to turn this spin-off into a series of its own. I think it would be great, if TSA could turn into its own series, sort of parallel to the No More Heroes series. The great thing also is that the story within TSA has a lot of direct connections to my ideas for NMH3, so if NMH3 does get created, what happens in TSA will end up being important for that next installment. I have the outline for the story for NMH3 already mapped in my head. Finally, Suda51 once again addresses returning to Killer7. We've heard Suda51 say numerous times that he'd like to do a Switch port and would like to include cut content, but this is the first we've heard him say that he doesn't have much interest in creating as sequel. I’ll just come out and clearly say that, I really don’t feel a need for there being any continuation to the Killer7 universe, as I feel that I sort of completed that world, and I sent out everything I could into it, basically. So, making another game that’s connected to this game, somehow doesn’t make sense to me. But there was a lot of script that was cut out back then, I felt too much was omitted from the game itself, so I can see maybe a possibility of putting out a more complete version someday that restores those cut-out parts. Suda51 is always coming up with new ideas. There are a number of projects he wants to tackle, but he didn't want that to result in a series like No More Heroes being left behind. In a Fandom interview, Suda51 talks about why it was important to him to return to Travis Touchdown. Again, while Suda51 has a number of new ideas kicking around, he's still fond of returning to his classics. While it's not the first time we heard this, Suda51 has elaborated upon his interest to bring Killer7 to the Switch.